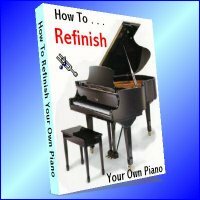 This manual on piano refinishing is available either as a digital download with printing enabled so that you can print out a hard copy or as a loose-leaf print-out of the digital version which will be mailed to you. Have you ever thought about refinishing your own piano . . .
but didn't know how to begin? "How To Refinish Your Own Piano"
Note: This is a loose-leaf print-out, not a bound book.